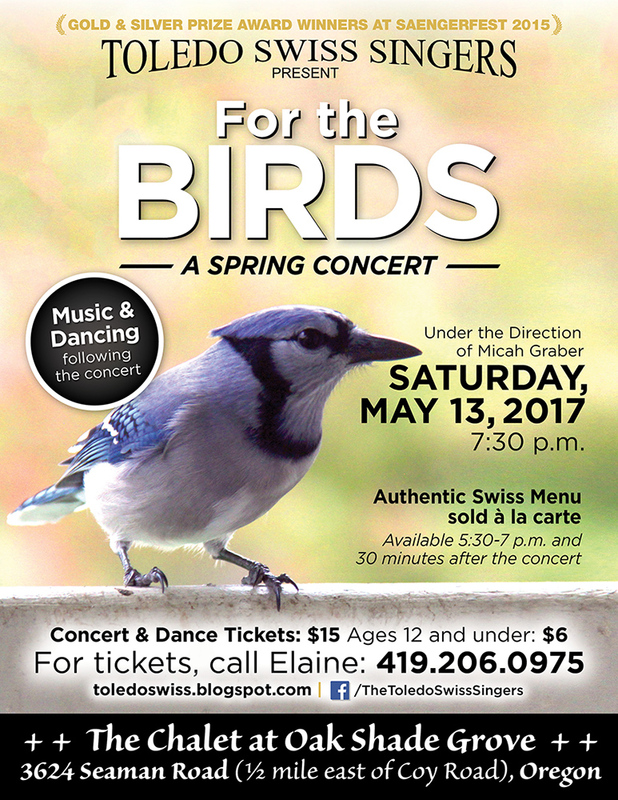 The Toledo Swiss Singers, one of the area’s oldest singing groups, will close the 2016-2017 season at their spring concert on May 13 by celebrating our area’s renowned birding week. The concert, titled “For the Birds,” will feature songs dedicated to our feathered friends, including traditional Swiss songs. The evening begins with authentic Swiss food sold à la carte, available 5:30-7 p.m. and 30 minutes after the concert at The Chalet at Oak Shade Grove, 3624 Seaman Road in Oregon, a 10-minute drive from Maumee Bay State Park. The concert begins at 7:30 — and is followed by music and dancing. Concert and Dance tickets are $15, with $6 tickets for children 12 and under. The deadline for reservations is Wednesday, May 10, with a few tickets available at the door. For tickets, call Elaine at (419) 206-0975. Currently under the direction of Micah Graber, the choir has been a cultural staple in the Toledo area since 1869 — that’s 148 years of celebrating Swiss culture in the area. The chorus in its current form has been around since 1924. Its aim is to retain and preserve the culture and songs of Switzerland, to live up to the singers’ ancestors’ tenets of faith and behavior, help others, and to be good citizens. The nonprofit organization is part of the larger German American Festival (GAF) Society, which most people associate with the festival held annually in August. The society consists of seven German-speaking societies. During the festival, the Singers set up and operate the Swiss Cheese Haus, along with the Stein Stossen contest. The GAF Festival draws more than 30,000 people on an average weekend and is the largest ethnic festival in this part of the country.